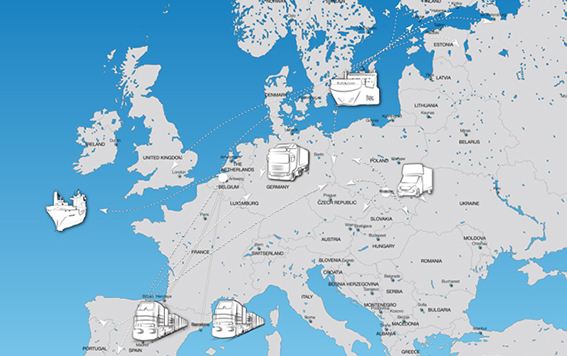 Transfennica Logistics offers a synchro-modal network from Finland, Baltics, Russia and the BeNeLux to the Iberian Peninsula and vice versa. Whether by short-sea, road or by rail, we can offer the fastest and most competitive solutions. Our unique network is based on Transfennica's own short-sea vessels combined with Tranfennica Logistics blocktrains, trailers and warehouses. The services offered varies from Groupage, Part loads, Express deliveries, Full loads to complete logistic solutions from door to end user including warehousing. Our focus is on optimising door to door container and trailer logistics and reducing costs by maximising the use of intermodal and contract logistics solutions. Our non-asset based operation guarantees independency and the best solution in each occasion which contributes to increased satisfaction of your customers. We help you to realise a change leaving traditional ways of transportation heading to more competitive and environmentally friendly solutions. Let us help you to improve your business and together we work on a cleaner world! We take care of dry, chilled or frozen full loads and groupage. Packed or bulk in containers and trailers, via sea, rail and road.